We work closely with medical and other professionals on the front line of the opioid epidemic in Palm Beach County regarding the early signals and symptoms of substance use disorders. Our symposia series educates first-responders to immediately recognize signs of trouble and initiate lifesaving plans of action. With education as one of the primary missions of Hanley Foundation, our commitment to community outreach is strong. We offer a number of professional events throughout the year such as “When Lawful Drugs Come to Work,” which explores the workplace impact of prescription opiates and medical marijuana as well as alcohol. Seminars like this provide insight to business leaders and human resource professionals while also giving individuals the opportunity to earn continuing education credits applicable to the renewal of their professional licenses. Hanley Foundation provides prevention and education programming free of charge to schools, churches, and community groups. A team of nearly 30 specialists, working in 15 counties across the state of Florida, educates communities about substance abuse prevention and facilitates these programs. 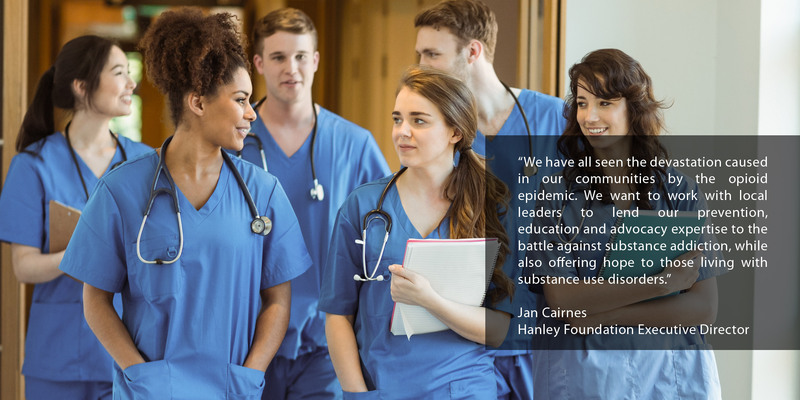 In 2016, Hanley Foundation provided nearly $1 million in prevention and education services in Florida, impacting the lives of nearly 30,000 students, parents, and caregivers. Our organization was recently awarded a $200,000 grants through the Florida Department of Children and Families for Hendry and Putnam counties. This grant is to study the best means of preventing alcohol and substance use disorders, and for providing mental health services for at-risk juveniles and adults. Hanley Foundation also received an additional $350,000 to support adolescent interventions in Lee County, Florida. To sign up for notifications regarding upcoming programs, click here.